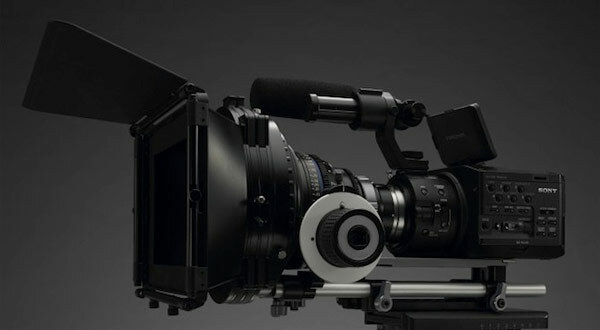 Sony to launch NEX-FS700E 4K cinema camera for $9,000 at NAB? What would you pay for the ability to capture cinema quality 4K video? $36,000? $18,000? Try $9,000. That's the expected price of Sony's rumored NEX-FS700E, which could launch at NAB next month with a June ship date. EOSHD reports that the camera will pipe 4K video to a dedicated external recorder over 3G HD-SDI. It will reportedly use the same NEX E-mount as its predecessor, the FS100, and may include a trio of neutral density filters to increase versatility. We haven't been able to track down an image of the rumored cinema cam (the model in that image above looks identical to the FS100), but we wouldn't be surprised to see another detail or two leak out before the broadcast community's annual Vegas gathering kicks off in a little over two weeks. For its part, Canon is also expected to announce a 4K EOS-format DSLR at NAB, as a less-expensive alternative to the $16,000 C300, while RED's Scarlet already has 4K capabilities, and a $9,000 price tag. Sony to launch NEX-FS700E 4K cinema camera for $9,000 at NAB? originally appeared on Engadget on Fri, 30 Mar 2012 13:36:00 EDT. Please see our terms for use of feeds.